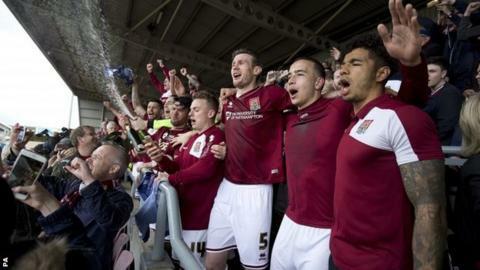 Northampton Town secured promotion to League One despite being held to a draw by Bristol Rovers at Sixfields. Nicky Adams headed the hosts into an early lead before Sam Hoskins side-footed in a second after the break. Matt Taylor's header and Ellis Harrison's low effort saw Rovers fight back to earn a point to boost their own hopes of automatic promotion. But the Cobblers, who faced a petition for administration earlier this season, are guaranteed a top-three spot. They have lost only once in the league since Kelvin Thomas's takeover of the club in November. Fifth-placed Plymouth's loss to AFC Wimbledon meant this season will be the end of Northampton's seven-year spell in the fourth tier of English football, following relegation in 2009. The Cobblers, who only escaped relegation to non-league on the final day of the 2014 season, are now 12 points clear at the top with five games remaining. Rovers now lie fourth, two points behind third-placed Accrington. The attendance of 7,579 was the largest ever recorded at Sixfields and Northampton's biggest for a league game since 1987. Northampton skipper Marc Richards will miss the end of season run-in as he is to undergo an Achilles operation next week. Match ends, Northampton Town 2, Bristol Rovers 2. Second Half ends, Northampton Town 2, Bristol Rovers 2. Goal! Northampton Town 2, Bristol Rovers 2. Ellis Harrison (Bristol Rovers) right footed shot from the right side of the six yard box to the bottom right corner. Assisted by Lee Brown. Attempt missed. Cristian Montaño (Bristol Rovers) left footed shot from the left side of the box is high and wide to the left. Attempt missed. James Collins (Northampton Town) right footed shot from the right side of the six yard box misses to the left. Corner, Northampton Town. Conceded by Lee Brown. Substitution, Northampton Town. Jason Taylor replaces John Marquis. Hand ball by John Marquis (Northampton Town). Daniel Leadbitter (Bristol Rovers) is shown the yellow card for a bad foul. Substitution, Northampton Town. James Collins replaces Nicky Adams. Substitution, Northampton Town. Lawson D'Ath replaces Sam Hoskins. Goal! Northampton Town 2, Bristol Rovers 1. Matty Taylor (Bristol Rovers) right footed shot from very close range to the bottom left corner. Assisted by Daniel Leadbitter. Jermaine Easter (Bristol Rovers) wins a free kick in the attacking half. Substitution, Bristol Rovers. Jermaine Easter replaces Billy Bodin. Attempt missed. John-Joe O'Toole (Northampton Town) header from the right side of the six yard box is just a bit too high. Corner, Northampton Town. Conceded by Steve Mildenhall. Attempt saved. Nicky Adams (Northampton Town) right footed shot from the left side of the box is saved in the top right corner. Corner, Northampton Town. Conceded by Tom Lockyer. Attempt missed. Sam Hoskins (Northampton Town) right footed shot from the left side of the six yard box is close, but misses to the left.